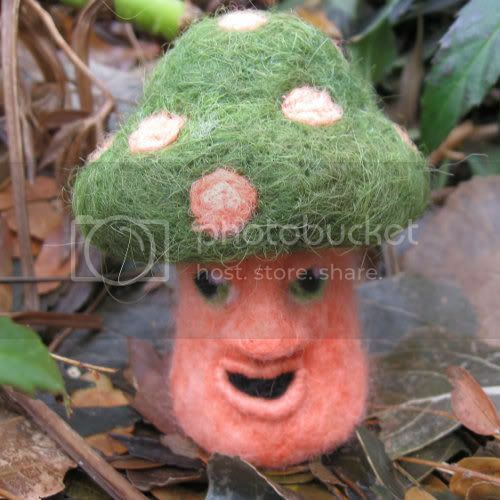 Mushroom season hasn't sprouted in Delaware yet, but a needle felted mushroom sculpture sprung fully grown out of my mailbox. His name is Mitch and he's related to Crystal, the blue mushroom sculpture that was adopted by one of my giveaway entrants last January. Both art dolls were born at Shana's Woodland Whimsy studio in Nevada. Doesn't Mitch match my blog's color scheme perfectly? Shana hand dyes the alpaca fiber using food safe dyes, then pokes a special barbed needle into it thousands and thousands of times to shape it into her cute creatures. He is one of a kind and mine, mine, mine - but he has kin that are still hoping to find a forever home. From Marli in teal and peach to Mervin in purple and moss green, a whole family of Fungus Among Us are available in her Etsy shop. How adorable! I'm a big sucker for toadstools and mushrooms. Checking her shop out! What a cute little shroom! I just love her work, really unique. I love Woodland Whimsy! I am awaiting my very own Gronk, super excited to meet him! Great work, would love to get into needle felting. Lovely!! And most important, funny! Wow! How cute is that! LOVE IT!